PHILADELPHIA—After spending more than $100 million to elect Democratic politicians, and with more money on the way, Tom Steyer basked in policy victories at the party’s convention this week as delegates adopted a climate and energy platform that closely mirrors his own positions. Steyer, a former hedge fund manager and strident environmentalist, decried the influence of money in politics at events in Philadelphia even as the party that he has spent millions supporting backed proposals for green energy subsidies and carbon restrictions that would benefit companies in which he has invested. "If you look at 2016 and the platform that we’ve agreed on, it is a quantum leap forward from four years ago," Steyer said in a television interview with Bloomberg. "I think we have the most progressive environmental platform in the history of the Democratic Party and in the history of American politics." More important than the platform’s specifics is the momentum he sees on climate and energy issues, Steyer said at an event in Philadelphia on Thursday morning. "I think the first thing you have to think about with the 2016 platform is where it stands relative to where we’ve been," Steyer said. "If you’ll remember, which is pretty hard to think of now, in 2012 the Democratic platform was based on ‘all of the above’ energy sources and clean coal." He attributed the shift to changes in public opinion since 2012 on climate change. But something else has changed since then: Steyer has become the single largest political donor on either side of the aisle. Steyer’s foray into political spending began in 2013, when he backed Virginia Gov. Terry McAuliffe and Sen. Ed Markey (D., Mass). Steyer spent more than $70 million on federal races in the 2014 cycle, making him the single largest donor to outside spending groups. He has poured another $31 million into his personal Super PAC, NextGen Climate Action, this cycle. According to Federal Election Commission records, Steyer has steered more than $105 million to independent expenditure groups and Democratic campaigns and party organs since 2013. Steyer insists that massive influx of money had nothing to do with the Democratic platform incorporating his specific policy goals. "You absolutely cannot" buy policy changes with political contributions, he told Bloomberg. However, in the case of the Democratic platform, changes were made following Steyer’s large influx of contributions that reflect some of his highest priority policy positions. The Energy and Environment Legal Institute, a free market group critical of Steyer, flagged at least seven instances where the platform closely mirrored Steyer’s positions on energy and climate. Most notably, the platform incorporates his primary policy goal: requiring the United States to generate at least half of its energy from non-carbon-emitting sources such as solar and wind by 2030. "We are committed to getting 50 percent of our electricity from clean energy sources within a decade," the codified language of the Democratic platform declares. Doing so will "creat[e] millions of good-paying middle class jobs," the platform states, echoing NextGen’s claim that it "will create millions of jobs and spur economic growth." E&E Legal said in a report this week that similarities between Steyer’s positions and those in the Democratic platform amount to "policy plagiarism." 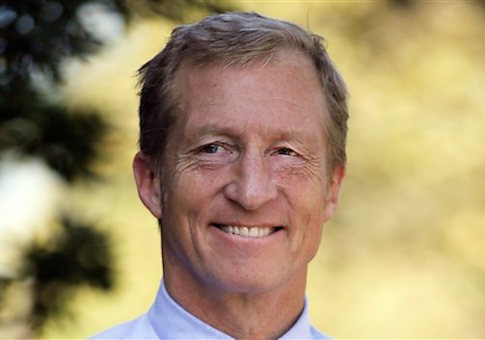 "When examining the 2016 Democrat Party climate change plank, it’s clear that Steyer, the Party’s largest donor, has left his fingerprints," the group wrote. E&E Legal also pointed out that Steyer’s nonprofit grantmaking group, the TomKat Charitable Trust, has disclosed financial stakes in companies that would benefit from the policies that he, and now the Democratic Party, are pushing at the federal level. TomKat is a limited partner in two investment firms—BrightPath Capital Partners and Eagle Cliff Partners—that back green energy companies. He insists that all profits from those ventures are reinvested in TomKat and do not redound to his personal financial benefit. To the extent that the Democratic Party’s new platform benefits Steyer-backed green energy ventures, then, his policy advocacy is self-sustaining: it will produce more resources for future advocacy. This entry was posted in Issues and tagged Democratic Party, Energy, Tom Steyer. Bookmark the permalink.